Some time ago I did some work for Accuquilt designing a few things. We ended up parting ways but the patterns I designed and rights to them are all mine. I debated and debated what to do with the designs and then finally I decided to just give them away for free here on the blog. This is a Snowman Table Runner. If you don’t have a Go Cutter don’t worry I’ve added some templates so you can make it anyway. It’s really an easy pattern which is good news because you’ll have plenty of time to whip one up for the holidays..and best of all, it can stay out all winter long. 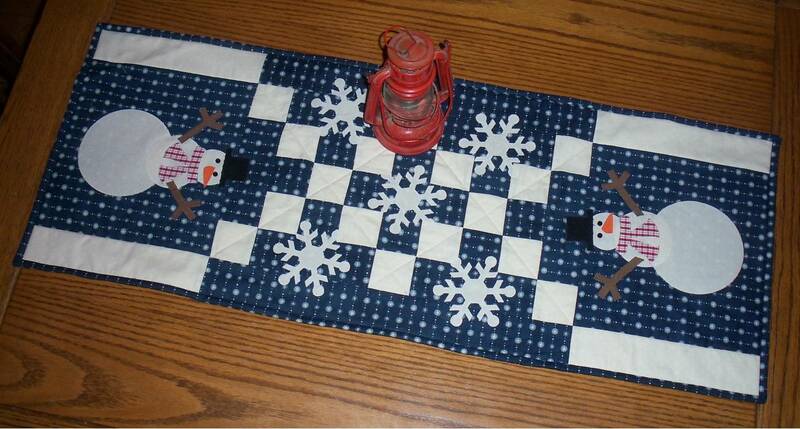 If you’d like the pattern click on this link for the Snowman Table Runner. The pattern is in PDF format so is you want to read it, you must have an Adobe Reader Program. It a free program and you can find it here. Although I have had this table runner completed for a long time, getting the pattern written and available to all of you is a finish for me!! Honestly, when making small projects like this writing the instructions can be harder than actually making the project. Today I am thankful for the people who love me unconditionally who aren’t my direct family. We have some good family friends…Rauschs and Krieners. I love that I can call them if I need anything. I love that they don’t judge…and don’t hold things against me. I love that their kids know they can call and ask for anything and that our kids can call them and do the same. We live far enough from family that sometimes our kids didn’t see their cousins very often….they found cousin type relationships with the our friends’ kids though. Last night on Facebook I sent a message out to my kids and asking who was going to be home and when. Our friends’ kids responded too. That’s so sweet to me and I’d love for them to crash our Thanksgiving…they are all welcome anytime! Today I am thankful for the people in my life that love me unconditionally.